Dr Silke Lange is the newly appointed Associate Dean of Learning, Teaching and Enhancement at CSM. Silke joined UAL in July 2015; in mid-August her honeymoon period with CSM was interrupted for two months as she participated in the Innovators Grant 2015 at the Node Centre in Berlin. During this residency, seven researchers from a range of backgrounds and disciplines investigated how thinking and strategies used in the arts can be applied for innovation in other sectors. 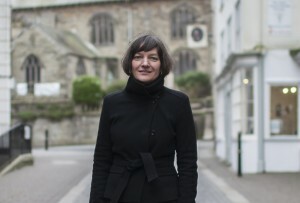 For Silke, the residency provided an opportunity to expand on earlier research, which focused mainly on the creative process, collective learning, interdisciplinarity, learning environments and the student as co-creator. Prior to UAL, Silke was the Director of Learning and Teaching in the Faculty of Media, Arts and Design, University of Westminster. We caught up with Silke to talk about her new role. Exchange: How do you see your research on the creative process and students as co-creators informing the work you do at CSM? Silke: My research into the creative process highlighted, amongst other outcomes, that this process is continuous, developmental and potentially transformative. It involves a certain mode of thinking, a level of risk taking, and approaches to working with materials in unconventional ways, making space for the new to emerge. This kind of practice is happening in all discipline areas and programmes at CSM and produces innovative designs, interventions and other forms of artistic expression. To enhance this level of innovative practice further, my focus will be on the learning and teaching at intersections of disciplines, and the spaces in between and across disciplines. In practice this will be in the form of collaborative activities and events, sharing and challenging discipline specific methods and perspectives, as well as exploring materials and ideas from different points of view. Students can be co-creators in a number of ways. My research so far has focused on students as co-designers of course structures and curricula, content generators, co-researchers, co-authors, and co-presenters at public events. My experience of working with students across this range of activities has been incredibly positive and invigorating. It is amazing to see the level of commitment from a student when asked to contribute to a ‘real’ event or to shaping their own learning. For example, I used to run a module based on the theme of identity. The teaching team provided pre-selected readings as a starting point; the next step was for students to form research groups and to generate further material around the topic. The broad spectrum of material covered by students during research seminars was fantastic and reflected the diversity of backgrounds presented in the student body. Through providing a space for students to explore material related to their own identity and letting them choose the direction in which to develop their practice, the module was perceived as meaningful, inclusive and rewarding for students, as well as staff. The student body at CSM is incredibly diverse and offers plenty of opportunities for exploring different forms of co-creation. I look forward to sharing my experiences with course teams and developing ideas suited to this community. Exchange: How do you see your own teaching practice as connecting and enriching your wider learning and teaching role at CSM? Silke: Collaboration and working across disciplines has played a big part in my teaching practice in recent years. Being able to work with students across subjects at CSM and not being attached to one single discipline is an exciting opportunity to share my knowledge of research methods and design thinking processes with groups of individuals who will all bring their own experiences and knowledge; together we can create the unexpected and the unpredictable. Exchange: You are a Senior Fellow of the HEA. Can you say a bit about how this has supported your practice, and how you see the role of teacher development in enhancing teaching? Silke: Being recognised by an external body for exploring and experimenting with one’s approaches to learning and teaching is very encouraging. It inspires you to keep asking questions about your own teaching practice, as well as testing out innovative ways of working with students. Looking at my teaching practice through the lens of a reflective practitioner, and receiving meaningful endorsements from colleagues who I have influenced in their practice, made me realise how much my creative interventions and disruptions in the learning environment had been appreciated by others. I found the experience of articulating my teaching practices for an audience beyond my immediate environment extremely useful, and recognised once again that the very process of reflecting on the practice of teaching comes almost naturally to the art and design practitioner, because it is inherent to our existence and the ways of working within our subject areas. Sharing this experience with colleagues can only be beneficial to all involved. Exchange: What would you most like to bring to the learning and teaching community at UAL? Silke: I absolutely love collaborating with people from wide-ranging areas and disciplines, and am very curious about ‘the other’; both lend themselves superbly to working across the various groups and areas at UAL and enabling the new to emerge. I can see ample opportunities to create partnerships and explore the potential of unfamiliar territory. Any individual, or team who is reading this and feels the same, please get in touch! This entry was posted in News on November 13, 2015 by Teaching and Learning Exchange.